Industrial robotics is pretty under-recognized It’s easy to think they’re all about manufacturing. But just watch as Motoman-MH24 normally found assembling or packing products in a factory, takes on a new lease on its automation life and becomes a master sword fighter. Motoman-MH24 is a 630-pound high-speed industrial robot made by Japan’s Yaskawa Electric Corporation. The Yaskawa Bushido Project is a short video clip showing Japanese master swordsman and five times Guinness World Record holder Isao Machii teach Motoman-MH24 the way of the sword. The company made this promotional clip to celebrate what they dub “manufacturing spirit” as they near their 100th anniversary. To date, Machii has demonstrated some pretty radical feats with his blade: slicing a flying shrimp pelleted at him at 80mph in half, and a neon ball flung at him at 150mph – and these are just some of the things the dude can do. The Yaskawa researchers examined Machii’s sword techniques in 3D. Next, they got Motoman to reproduce the very same movements, and the results are superb. In a showdown between master and robot-apprentice, the pair first demonstrates a four-directional cut in flawless sync. Then Motoman-MH24 reproduces each of Machii’s cuts down to a tee. Things start really heating up when the robot actually looks like it’s gaining an upper hand over its human trainer. While Machii horizontally slices one orange, Motoman-MH24 takes down six in one fell swoop. The most epic scene is probably the one where Motoman splices a really thin pea pod in half. While Machii looks visibly tired towards the end of the final “1000 cuts” scene, his mechanical counterpart could probably go on for at least an extra 100000. Click to view our Yaskawa Drives and Controls currently for sale. At MRO Electric and Supply, we are experts at retrofitting older HMIs with a new interface that is clean, modernized, and still works with your system. 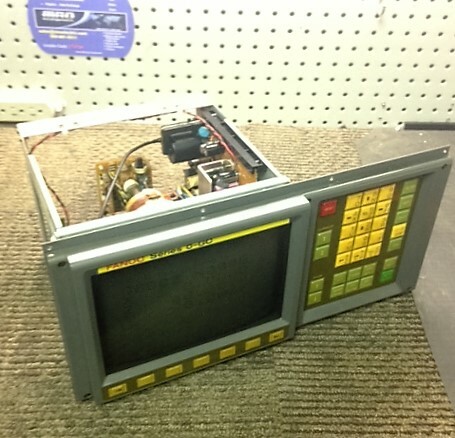 Take this older Fanuc HMI as an example. The old CRT display has begun to fade out, making its use inefficient and none user-friendly. 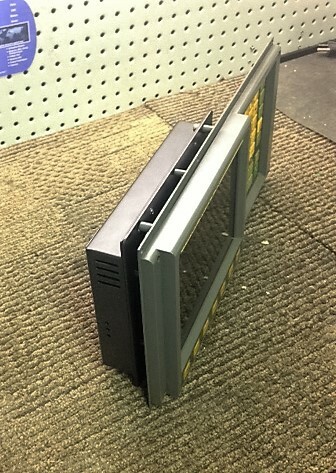 Old CRT screens are also prone to overheating, and they take up a lot of much needed space. A new LCD retrofitted screen can give you more accessibility, brighter displays, and user-friendly colors. MRO Electric can quickly update your FANUC Displays and HMIs at a fraction of the cost of replacing your whole HMI. You also don’t have to rewrite your programming, or waste time and resources replacing your whole system. Below is a fully retrofitted Fanuc HMI with an LCD monitor. This lighter, energy-efficient replacement adds years of life and service to existing legacy equipment, and eliminates potential future downtime. 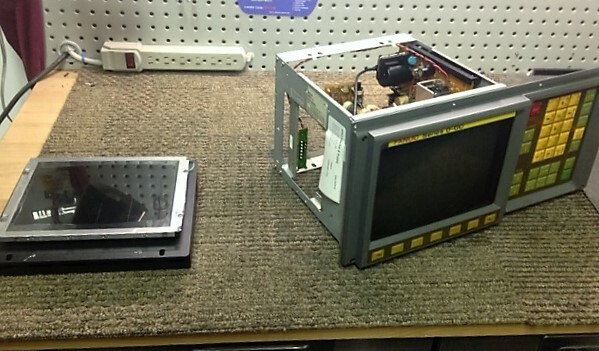 In addition, all of our HMI repairs come standard with a 12 month warranty. Get in touch with us today to learn more about this cost effective solution for your HMIs. You can request a quote by calling 1-800-691-8511 or by emailing sales@mroelectric.com.